Williams have had a busy Friday at Silverstone. The team have tested several different diffusers and front wings, along with revised engine settings to cope with the changed regulations. Rain made it more difficult to evaluate the parts, so the decision whether to use them on Saturday will not be easy. "All of today’s running was done on wet or intermediate tyres. We still managed to get through our test programme, however. 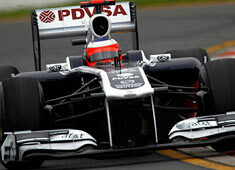 That included evaluating diffusers, exhausts, front wings and revised engine settings following the regulation changes. We're now going through all of the data before we make our decisions on what race specification we will run." "It’s been a wet day, obviously, and that kept us in the garage for some of the second session. We’ll have to see what the forecast is like as we go through the weekend. We finished in the top ten which is good but there’s more to do." "It was quite difficult today because the track changed quite a lot and we were going between the full wet and the intermediate tyres. We also had limited running, especially this afternoon because of the rain and because we wanted to save our intermediate tyres. We look competitive and the car is feeling good so I’m positive. I have spent a lot of time here and I love the track, so I’m looking forward to qualifying tomorrow."